The diner has become as much a part of our cultural fabric as baseball and Mom’s apple pie. 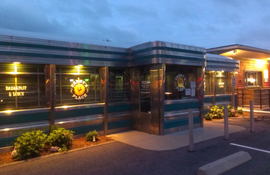 The first diner was established in the state of Rhode Island in 1872, and was one of those great American inventions that came as the result of hard work, ingenuity and an authentic entrepreneurial spirit. When he was just 17 years old, Walter Scott worked part-time on the printing press at Providence Journal. To make extra money, he sold coffee and sandwiches out of a basket to nightclub patrons and shift workers at the newspaper. Ultimately, the sandwich business became more lucrative than his day job and Scott quit to work full time, selling food from a horse-drawn wagon that he would park near the office of the Journal. The rest was, as they say: history. A typical diner consists of a long counter with stools for patrons that faces a cooking and service area at the back of the building. Some diners were actually made out of trolleys and train cars that were decommissioned by owners who couldn’t afford to build a new restaurant or buy a prefab building. Over the years the size, shape and structure of the modern diner changed with the times. In the 1920s, many diners tried to move away from negative perceptions associated with running a business that catered to the late night dining crowd. Diners eventually set up permanent locations and grew in size to accommodate more customers, adding restrooms, tables, flowers and other family-friendly elements to attract a new clientele. They also began serving breakfast and lunch to working class customers rather than focusing on late night diners. In the 1930s a more modern version of the diner appeared. Manufacturers created “futuristic” looking models that were made to give the perception of speed and mobility – even if the diner was stationary. This was a direct reflection of the cultural changes associated with the machine age and advances made to modern transportation. Diners became an asset to the American people during the Depression, providing a low-cost business opportunity to entrepreneurs and an affordable place for impoverished people to eat. The economy picked up shortly after World War II and the diner industry grew overnight, with dozens of diner manufacturers and business owners taking advantage of growing consumer interest. Manufacturers began adding new features, such as booths made of Naugahyde and counters made of Formica, and other new materials that were developed during the war era. Diners had another makeover in the mid- to late-1950s to reflect a new interest in technology advances made in rocket and jet transportation as part of the space age. Many of the popular diners and chains of today have embraced this popular look and feel of the 1950s, bringing back retro furnishings, materials and music to impart this iconic experience to their customers. Interest in diners dwindled in the 1960s due to huge growth in fast food restaurants, but in the 70s and 80s, popular national franchises began to embrace to diner era, offering diner-style food along with booths, counters and traditional diner décor. American families and vacationers began flocking to these small-but-friendly diner restaurants, and the interest and support for this type of homegrown eatery remains today. Diners have even permeated television culture in America, with popular shows such as Food Network’s Diners, Drive-ins and Dives, featuring small mom and pop establishments all over the country. Many diner enthusiasts will even plan interstate or cross-country trips around recommended eateries so they can sample a great taste of American cuisine while out on the road. There are a lot of ways to support diners in your area and across the country. The best way is to visit a local restaurant like Percy’s Place in East Providence, Rhode Island and enjoy a great breakfast or lunch in the traditional diner-style. It’s a great way to get a taste of real American food and culture, while enjoying a unique eating experience with a sumptuous side order of our nation’s rich history. Persy’s Place has just opened a new authentic American Diner restaurant in East Providence, Rhode Island. Be sure to visit us!